Babywearing can be great for extra bonding time, or to keep your baby close while you are busy around the house. Many moms enjoy having a secure way to carry their baby close to them and still have their hands free. The difficulty is finding a great carrier that works for you. The Baby K’tan is an option you might want to consider when picking out your carrier. 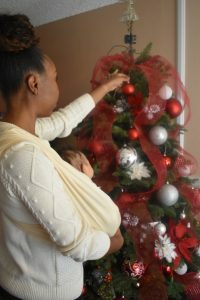 The K’tan is designed to be a soft, comfy carrier to carry your baby around the house or on the go with ease. It doesn’t have any buckles or plastic pieces and is made completely from the knit of your choice. There are several options including Jersey knit, performance sport knit, and a few others. You can also get it in cotton, polyester, or organic cotton. It eliminates any complicated wraps and is very simple to put on and take off, making baby-wearing super convenient and easy. There are also several other options you can choose from when buying your K’tan. You can use your Baby K’tan for quite some time as it can hold up to thirty-five pounds. Why is it better than other carriers? The K’tan is designed keeping in mind the busy lives of parents. It is simple to put on and take off and is machine wash and dryer safe, so you don’t have to worry about any special instructions to clean it. It also comes with a carrying bag that converts to a sash to provide extra support for your infant. The Baby K’tan is a high-quality product created to make your life easier. The International Hip Dysplasia Institute has approved this carrier as hip-healthy. Since your baby is in a seated position with their hips spread and their knees bent it allows them to develop naturally without putting unhealthy pressure on their hips. One thing that moms love about this carrier is that it has five different positions it can be used in, all without doing any different wrapping. The weight from this wrap is evenly distributed across your back and shoulders to avoid back or shoulder pain from too much weight in one spot. The cotton fabric has a luxurious soft texture which makes you and your baby comfortable. On some wraps you might feel like the fabric is digging into your skin, but the Baby K’tan is comfortable and the weight is evenly distributed to prevent this from happening. Mothers who have used it have said that it very secure and that they weren’t worried about their infant slipping out or the carrier failing them in any way. They also mentioned that they didn’t feel overheated at all, which is a huge bonus when wearing a baby carrier. Many moms love having their newborn babies safe and secure and near them while they are able to catch up on things they need to get done. This carrier helps you do exactly that. The only downside we found was occasionally it might be difficult to find the correct size at first if you’re in-between sizes. Some people may find it difficult to nurse due to this issue, but if you stick with it you will be able to find a way to make it work. We encourage you to be patient and give yourself time to experiment enough to find comfy positions for you and your baby.